Hello, I am not able to see the game in the thumbnails and the thumbnails will not appear when i open the game. They show up outside of game in front of all other applications but not in game. What’s the mode you use to run EVE? Press Esc, in the options dialog appeared select 1st tab (‘Display & Graphics’) and check the Display mode (the most upper left dropbox) - what value do you have there? I’m dumb. i see it now. fixed windowed mode it is. I’ve actually noted that it’s just the default character-select window that renders at 0,0, and doesn’t matter if I save the window elsewhere either positive or negative value. What I’d like to happen is that is doesn’t cover up my main window while I’m logging in. I’m having troubles even launching the program. Also, minimize not works good on latest win10 if you not run eve-o with admin rights. You start your EVE clients with elevated privileges. Obviously a program started using an ordinary user privileges (ie NOT as an Administrator) cannot do certain things with Admin-user windows. Windows security and so on. Hi, i am using your great tool and it work perfect! i wanted now to expand my windows and installed eve on second computer and installed same settings as on main computer. when i am using a regular monitor, then the “preview” windows show the correct window of eve. BUT when i am connecting to that computer via remote desktop or teamviewer or VNC etc… it works, but the preview windows are only black . do you have an idea? Well, apparently the tech used by EVE-O can’t work on remote desktops. and an other issue that i have. when i open e preview. it place often some windows wrong, not at the last position: example https://i.gyazo.com/e57bf53e6eeebe7bd55f58725d05eb38.jpg maybe there should be a template that can be saved and loaded and not autosaved? I’ve been using eve-o for the last 4 months without issue. Love the program and pass it onto others to use. Today, after acting normally for awhile, I encountered an odd error. The preview client window was ‘frozen’ for one of the windows. When I opened the client that had an issue, it would automatically open the other clients with just a mouseover. Usually, I would have to click that for it to work. I restarted my eve clients, and the problem spread to all of the clients. I restarted my computer, and again it happened. I uninstalled eve-o, rebooted, and re-installed. Any suggestions to troubleshoot this? EDIT: Fixed it! 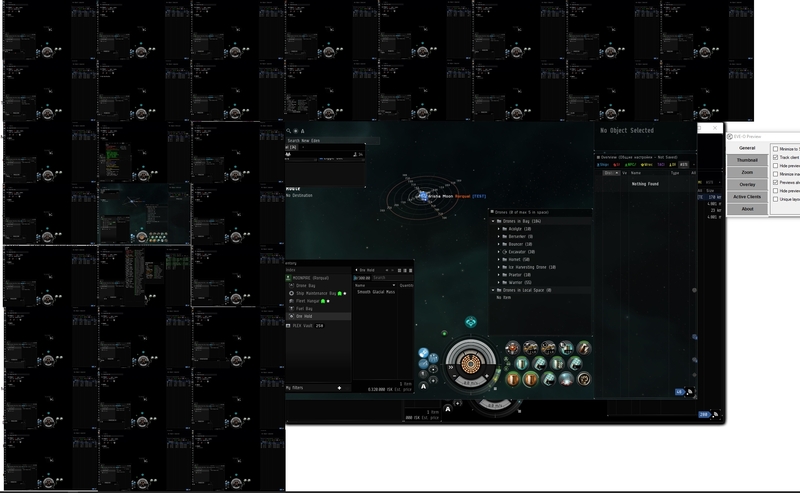 For some reason, my eve clients reset to fullscreen mode. I uninstalled eve-o, rebooted, and re-installed. Just for the protocol - EVE-O doesn’t write anything outside of its folder, So just deleting the .json file would be sufficient to fully reset the configuration. The preview client window was ‘frozen’ for one of the windows. A nice new “feature” of Win10 - if your client (or any other app) is minimized, then Windows does NOT refresh its thumbnail. Literally nothing can be done here. I guess that when an EVE client runs in fullscreen mode, all other clients are being treated by Windows as minimized, thus their previews are turned into still images.